Procon Technology can supply the following Ultra-Violet (UV) or black-light flashlights or torches. Please see prices below and email us for quantity pricing. In Australia, call 03-98306288 now to buy! For a bit fun - click here - to watch some black-light music videos. ST3386UV (above left) NEW 4-LED VERSION! This torch provides four (4) black-light or Ultra-Voilet (UV) LED lights (340nm to 420nm output) with an additional COB (Chips On Board) LED white light. Size: 90x55x35mm (3.5x2.2x1.4") Weight: 85gms with batteries included. 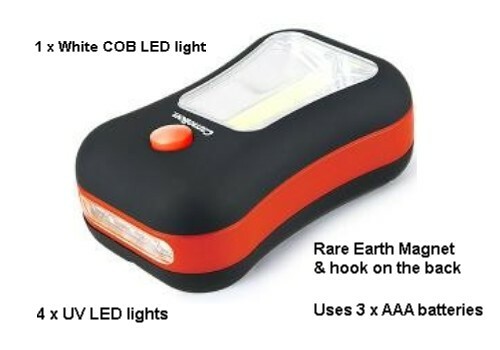 Requires 3 x AAA alkaline or rechargable batteries that operates the UV torch for hours on high brightness and for many days at lower brightness. The unit also incorporates one COB LED white strip-light and has pushbutton operation that toggles between the lights. For hands-free operation the torch also incorporates a hook and a powerful rare earth magnet! A UV LED provide a general purpose UV torch is suitable for all applications such scanning UV sensitive inks that are often used on cheques, passports, postage stamps and other printed material as it contains four high intensity UV LEDs that radiate less visible light! The ST3386UV is great for checking UV sensitive inks. This torch can also be used for checking driver's licenses etc. The SL-3146 "Mini UV Fluoro Light w/Torch" is ideal for document inspection of printed UV sensitive inks. e.g. Cheques, Passports, Money, Stamps, invisible ink "secret" messages etc. Size: 160x55x24mm (6.3x2.2x1") Weight: 190g with batteries. Uses 6" long 4W mini fluorescent tube (F4BLB) which is protected by a clear plastic cover. Includes a small PEN LIGHT torch, carry strap and 4xAA Alkaline batteries (the use of NiMH batteries is not advised). Good quality Alkaline batteries will operate for 4-6 hours. The UV or Black-light output provided is at 362nm to 365nm wavelength (a smaller peak occurs at 405nm). Includes robust slide switch and attached battery cover which stops it from being lost! .............. better than Sanyo eneloop with LSD $22.00 $24.20 . Delivery charge within Australia $11. Delivery to all overseas destinations - P.O.A (ask us). EX-GST purchases may only be made when the delivery address is outside of Australia. i.e. for EXPORT orders. Prices subject to change without notice. Safety issues: We recommend not to look directly into UV LED lamps (or via a reflective surface). We also recommend the use of eye and skin protection when UV lamps are used for long periods. www.phoseon.com have this to say 'The spectral output of a solid-state UV LED is narrow peak of energy near 400 nm – a safe region for workers.' They go on to say, 'Solid state light sources, such as those formed from UV LEDs, eliminate all of these risks (associated with using mercury lamps) and enable new applications where these curing lamp issues were barriers to entry.' Note: All devices shown here are not recommended for small children, especially 8 years and under as they contain small parts that may be swallowed. Older children should only use these under adult supervision. The wavelength for LED UV lights is around 400nm and is considered safe but we always recommend the the use of eye protection and a bit of 'common sense'. i.e. do not look directly, or indirectly by a mirrored surface, at the UV lamps! DO NOT OPERATE for long periods without eye protection! Disclaimer: The above specifications may be subject to change without notice. The manufacturer and Procon Technology hold no responsibility for damage expenses, lost profits, or any other claims arising from the use of these products. What is ultra-violet light? click here. What is black-light? click here. ODD SPOT 1: A Chinese pig has given birth to 2 out of 11 piglets who's mouths, trotters and tongues glow fluorescent green under UV light. The mother is one of 3 pigs successfully bred by a research team in 2006 with this condition. ODD SPOT 2: Taiwan's Education Ministry has banned fluorescent-ink pens from exams after finding students carrying notes written with the pens. The notes were invisible until students scanned them with an ultra-voilet light fitted on the other end of the pen. TIP: try a yellow high-lighter pen for your hidden messages on the skin (or on other similar coloured surfaces such as oranges and lemons or yellow paper). Note, highlighter ink is permanent so you'll need to really scrub to get it off! This provides a great illustration of how to wash your hands properly. i.e. write something on your hands in yellow higherlighter pen. After washing your hands they may look clean but if you haven't washed thoroughly, the message will still appear under UV light! ODD SPOT 3: Make your own glow in the dark flowers for Valentines day! Simply use a highlighter pen and squeeze some of the ink into water in a vase, leave your flowers (white carnations are best) overnight in the vase and under UV light the flowers will glow... as will the water! click here. ODD SPOT 4: Fluorescent mosquitoes are being used by scientists in Perth, Australia to study their flight activity - click here. ODD SPOT 5: The work of Archimedes was revealed using UV light on a document called a palimpsest (ancient overwritten manuscript). click here. HOW TO CATCH A THIEF: Although you can buy special UV ink (don't ask me where), we found that these tend to dry up quickly, so our recommendation is to use a yellow Hi-lighter pen and coat a $50 note with it. Not only is the note easily identifiable when scanned with UV light but the thief's hands will have traces of ink on them! ACCESS CONTROL: Often access to events is controlled using an invisible mark or stamp on a hand or card that fluoresces under UV light. UV light is also great for checking Australian driver's licenses which now have UV sensitive markings. Take note bouncers and security staff - it allows you to check for fake driver's licenses! Remember to check the driver's license under normal light first because some fakes may have the UV markings permanently printed on the license using normal ink! ANTIQUE HUNTING: Often cracks and repairs to antiques and valuable items are not visible in normal light. Under UV they will show up clearly! CRIMINOLOGY: Check crime scenes for fingerprints (using fluorescing dusting powder) and for some bodily fluids (as seen on the TV series 'Monk'). Locate the presence of accelerants in arson investigations. See hidden messages, as in the movie 'Gone in 60 seconds' and in Dan Brown's book 'The Da Vinci Code'. Note, even if the body fuild is cleaned up and the surface 'appears' clean under normal light, UV will often show it up - unless, of course, you really scrub the surface or use a strong cleaning agent! This is why cleaning companies (hotel and hospital management) like to use UV - they can check how good the cleaning job really is! I also found this with UV ink smeared on a glass surface (if the ink is still wet and a person touches it, their finger prints will appear under UV light). If you simply wash the glass under water the marks will still appear - you need to really scrub it or put it in the dishwasher! To detect blood you will need a reagent that reacts and makes it fluoresce - click here - "Luminol is used by forensic investigators to detect trace amounts of blood left at crime scenes, as it reacts with iron found in hemoglobin." Or you can make your own reagent using fluorescein from marker pens! click here. CLEANING AND CLEANINESS: Check the stains on your carpet. Many substances and cleaning agents fluoresce under UV light. I've been assured that it shows up dog or cat wee on carpet (it's annoying when you can smell it but can't see where to clean). The ST3024UV torch is great for showing up all those old stains on carpet. It is now being used in nursing homes to detect human stains (due to incontinance). I have used it to check the carpet in our bedroom and I can say that I will never ever go naked to bed again and I will be getting the carpet shampooed a.s.a.p. It is also great for checking around the toilet. Every stain on the bowl, floor and walls are highlighted. Horrifying! It's not quite what you might think it is (on the toilet walls especially). Because, as the Myth Busters on TV explained, everytime you flush the toilet small droplets go into the air (a good reason to put the toilet seat down) these end up on the walls and floor surrounding your toilet! These droplets and stains glow a greenish or yellowish colour under UV light. Another problem with toilets is the stains around the hinges of the toilet seat. UV lights shows this clearly and illustrates why you should be detaching the toilet seat on a regular basis and cleaning properly! Tiled surfaces also show up problems under UV, especially the grout between the tiles which is often not cleaned properly just using a mop. Note, cleaning companies may wish to use the UV light to demonstrate to potential customers how bad their carpet or toilet area is! All hospitals, medical faculties and nursing homes should be using UV light to check cleaniness! STOP PRESS, as seen on the reality TV series 'It's Me Or the Dog', use UV light to detect dog wee and clean it up properly. Otherwise the dog will do it there again to mark their territory! This also provides a very good reason why, if you intend to have pets inside, you should get the carpet and all floors throughly cleaned before you move into a house. ARTWORK & CARPET REPAIRS AND VERIFICATION: Many modern inks, paints and dyes may look identical to old colorings under visible light. However, under UV, differences can be seen because the chemical composition of newer substances usually includes synthetic materials. Could be used to scan art work (such as paintings) for touch up and repairs. Many plastics which may look identical under normal light will show up as different under UV. CURRENCY, CREDIT CARD & STAMP VERIFICATION: Australia, USA and many other countries currencies, credit cards and stamps contain images visible only under UV light. Check out the serial numbers on Australian notes and UV sensitive coding on Australian mail (bar coding). Visa and Mastercard credit/debit cards now have UV sensitive markings. Note, every stamp collector should have a UV light as some stamps were printed on fluorescing paper (German stamps look white but change to yellow under UV), some have UV sensitive patterns over printed on the stamp sheets (Indonesian stamps) and some have UV ink used. Also, as I found, the old fashioned stamp hinges used fluorescing glue! CUSTOMS & IMMIGRATION: Some passports and visas have images visible only under UV light. Document and forgery analysis: Alterations or changes will sometimes become directly visible when illuminated with UV light. ELECTRONICS INDUSTRY: EPROM (Erasable Programmable Read Only Memory) chips contain a small window which when exposed to UV light erases the memory on the chip. UV can also be used to show up some defects in PCBs (Printed Circuit Boards) and electronic components. FOOD INDUSTRY: It is necessary to identify rodent presence in all areas of the food industry. Although rodent urine and hair may be invisible in normal light they fluoresce under UV light. Use a UV ink to mark a pig's carcass (for example) that is easily read under UV light but doesn't spoil the product when on-sold to customers! GEOLOGY, GEMOLOGY & LAPIDARY: Revels fluorescent activity in minerals and gems. For example, jewellers use UV light to differentiate YAG from tanzanite or synthetic corundum. Miners often use UV light to check mine walls and rock faces for gems. Breaking News: Most blue diamonds glow blue or white under UV light, but the Hope diamond (cut from the French Blue Diamond, part of the French crown jewels worn by King Louis XIV) glows red indicating a mix of boron and nitrogen. i.e. can be used to classify or "fingerprint" blue diamonds! HOBBIES AND SPORTS: Besides being useful in Philately (stamp collecting), paper money collecting and Entomology (insect collecting), UV light can also be useful in fishing as a lure. HVAC & AUTOMOTIVE SERVICE: Add UV powder or liquid to a system and leaks can be identified under UV light. You can also mark car parts using a UV sensitive ink (e.g. highlighter pen) to check that your mechanic has replaced them when servicing your car. UV can also be used now to check for the location of DataDots security markings on car bodies and parts. i.e. thousands of microscopic dots are laser-etched with the VIN (Vehicle Identification Number) onto many vehicles. HVAC = Heating, Ventilating, and Air Conditioning. MEDICAL: Locates dermatological bacteria that glows under UV light. Used in conjunction with an indicator fluid in eyes to check for foreign objects and as a skin treatment for psoriasis, Lichen Planus, eczema, dandruff, and seborrheic dermatitis under a doctor's supervision. As seen on TV (Harry's Practice), an indicator fliud can be placed into an animal's eye to check if it comes out the nose (if not, there is a blockage). MANUFACTURING: Used to cure many special epoxies and glues. Used in the fiberglass industry to cure composite resins. Used to detect leaks as mentioned above. May be used in quality control (QC) and test procedures. PEST CONTROL: Identifies the presence of rodents, scorpions, lice and other insects. Can be used for insect attraction. SALES & MARKETING: Use to quickly energise glow-in-the-dark products for testing and demonstration purposes. Use to demonstrate security and other products as listed. SECURITY & SECURITY & CRIME PREVENTION: Neighbourhood Watch recommends that you mark valuables using a UV sensitive ink with your driver's license number (in Australia preceeded by the first letter of the state. e.g. V for Victoria). Enforcement agencies use UV light to check for such markings. p.s. If the object being marked is very small, simply smear the ink over the object and firmly press your thumb print into it for clear identification! NOTE, markings need to be re-done every 1 to 2 years (more frequently if the object is handled or exposed to sunlight). SHOP SECURITY: As a low-cost security measure, use yellow hi-lighter or UV sensitive ink to mark products. Use UV light to determine that the item comes from your store. e.g. have customers exit through a UV light room (use UV fluorescent lights) and detect those wearing shoes marked with the ink! Also mark notes and coins for clear identification when trying to catch staff theft. SPECIAL EFFECTS: Obviously UV lighting is used for special effects in discos, theatre, lighting displays etc. UV lights can also be used to illuminate fluorescent effects in insects, fish, rocks and minerals, paintings and art work, hair dye, body art, jewellery and clothing, clocks and many other items can be made to fluoresce. TATTOO: Some tattoo inks are invisible unless under UV light. Such UV or black-light tattoos are often obtained by people who do not wish them to be visible in normal light. Others like to highlight their tattoos with additions that glow under UV light. Such tattoos using UV sensitive inks could also be used to identify animals.